Sally takes you through the the practice of making the most Ordinary living and working situations Extraordinary with color and space. Investigate, discover, and then create the atmosphere you desire within your own home. Sally shows you how any space can be restful, nurturing, festive, warm, rejuvenating, calming, invigorating, uplifting, recharging or all of the above. 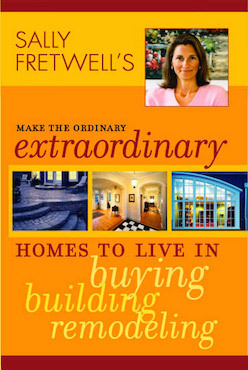 Architectural psychologist, Sally Fretwell leads you down the path to make the ordinary extraordinary, encouraging you to explore the idea is to make your living space your own. She gives you ideas and tools to discover what you are looking for and to know when you find it. Using both personal and professional, experience Sally gives you the benefit of her many years of successful design consulting. With simple examples of how to define your home, office, or business with the use of lighting, color and space she helps you understand that having the home of your dreams is not about being wealthy, but having a wealth of vision creativity and intuition. Sally will show you how to make your home a place that rejuvenates, recharges, and lift your spirits.